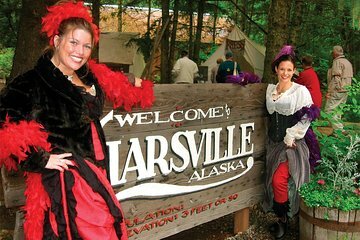 Complete your stay in Skagway with a traditional Alaskan salmon-bake buffet, and enjoy this 90-minute experience in the woods of Liarsville. After feasting on as much grilled wild salmon as you like, stroll through the historical village that spawned tall tales during the Klondike Gold Rush. Check out 19th-century exhibitions at the Gold Rush–era campsite replica, and gain insight into the town’s colorful history from in-period characters. Hotel transport included. Lots of food, other than salmon. Nice people.